Tianjin, Located at the coast of the Bohai Sea, with a history of over 600 years, is the largest open coastal city in Northern China. It is also a national key city and the economic center of Bohai-Rim Region, known as one of the cities with rich local colors around the world. Tianjin First Central Hospital, situated in the southwest of Tianjin, is a comprehensive hospital in medical treatment, teaching, scientific research and disease prevention and protection. The hospital takes Organ Transplant, Emergency Medicine and Otorhinolaryngology as its hallmark and has been categorized as an AAA hospital. The hospital founded in 1942 as Tianhe Hospital, and was renamed as Tianjin First Central Hospital after merging with Chinatex Hospital, Hospital of Posts-Telecommunications, and Enguang Hospital in 1956. It has more than 1,500 beds and consists of 47 clinical professional departments, among which are 5 national key clinical departments, 3 municipal key clinical departments and 6 municipal research institutes, besides a key critical care and emergency medicine laboratory affiliated with the Ministry of Health, and a clinical medicine post-doctoral workstation. The number of annual reception of outpatients and emergency patients is over 2 million. The hospital has a strong technical force of more than 2,500 professionals, among which 450 have senior professional titles and 34 receive the special allowance of the State Council. It is a national base of standardized training for resident doctors and general practitioners. In 2017, it became the affiliated hospital of Nankai University, and undertakes the theoretical lecturing and clinical teaching for 6 institutions of higher learning including Tianjin Medical University and Medical College of Nankai University. Since the 12th Five-Year Plan, 278 research projects of different levels have been approved, of which 61 are national level. The hospital has completed 265 achievements in scientific research and won 22 science and technology awards such as the National Prize for Progress in Science and Technology and the Chinese Medical Science and Technology Award. The Organ Transplant Center was established in 1998. Led by Professor Shen Zhongyang, a well-known organ transplant expert, it has been authorized as the only organ transplant center in China which can perform transplantations of liver, kidney, heart, pancreas, lungs, small intestine, islet cells and cornea both for adults and children as well as the biggest organ transplant center in Asia with sized disciplinaries and specialized division of work, and laying equal stress on unique technology and service philosophy. With over 200 beds and 300 staffs, the center has successfully performed more than 10,000 liver transplants, and the survival rate is achieving international advanced level. In addition, the center has successively helped 70 medical institutions in 22 provinces in China with liver transplantations. Meanwhile, they created a comprehensive system for preventing HBV re-infection after liver transplantation which has reduced the rate of HBV re-infection from over 80% to below 5% and prolonged the average survival from 2-3 years to long-term. The center took the lead in establishing a relevant national guideline, and thus broke through the bottleneck in liver transplantation and made pioneering contributions for the development of China’s organ transplantation. The Department of Critical Care Medicine, as the first Emergency Medicine Institute in China, was created by Professor Wang Jinda, the famous founder of critical care by means of traditional Chinese and western medicine, in 1974. The brand new theory of “treating both bacteria and toxin” and the therapeutic principle for sepsis with traditional Chinese and western medicine (four therapies for four diseases) still have the guiding significance nationwide. It has a key critical care and emergency medicine laboratory authorized by the Ministry of Health, and two national periodicals, Chinese Critical Care Medicine and Chinese Journal of Integrated Traditional and Western Medicine in Intensive and Critical Care. Their treatment of sepsis and MOF patients has reached the international advanced level. The institute has received financial aid from the nation as a key clinical department and is a key discipline in Tianjin. The Otolaryngology-Head and Neck Surgery was founded by Professor Lin Bijin, a famous otolaryngology expert, in the 1950s. In 1989, Tianjin Otolaryngology Institute was established, which is also the most advanced in China and the key discipline in Tianjin. It is also the state cochlear implants and endoscopy training center with 8 clinical sub-disciplines including otology, head and neck surgery, rhinology, naso-orbital-basicranial, sleep apnea and noise injury as well as 12 labs and examination rooms including deaf disease, vertigo, nasal function, noise injury and sleep apnea. It firstly performed laryngeal cancer surgery and hypopharyngeal cancer surgery and meanwhile preserved laryngeal function. The departments such as cardiology, cardiovascular surgery, neurosurgery, neurology, gastroenterology, general surgery, obstetrics, gynaecology, urinary, neonatology, rheumatology?and?immunology, reproductive etc. have maintained momentum in development. The professionals in plastic surgery and burn department, orthopedics department and emergency department have rescued critically wounded patients in various disaster relieves. The interventional therapy of complex coronary heart disease, treatment of refractory hypertension, interventional and operative treatment of CHD, valve disorder, macroangiopathy and cerebrovascular disease, treatment of severe craniocerebral injury, operative treatment of femoral head necrosis and hemophiliac arthritis, en-bloc exenteration of bladder tumor by holmium laser, microsurgical sperm retrieval, radical cystectomy and neocystostomy, treatment of ASO and in-stent restenosis by current catheter ablation under excimer laser and radiofrequency ablation of varicose vein of lower limb have been in the lead of the city. Tianjin First Central Hospital has set up a two-way referral system with medical service institutions in communities. It has gained mutual recognition of medical imaging examination data in Beijing-Tianjin-Hebei Region. It has also been authorized by the National Chest Pain Center and Tianjin Stroke Center. Meanwhile, it is the training base of Tianjin Rescue Center of Severe Pregnant and Lying-in Women and national clinical pharmacists, and a national drug clinical experimentation institution as well. The hospital adopted the concept of Internet cross-border integration and created a new mode (joint action of medical insurance, medical service and drug) of convenient hospitalization for patients. In such a way, online and offline are connected while a multiple-dimension patient service system is formed. An Internet hospital with functions of mobile health care, mobile officing, regional collaboration, telemedicine, electronic prescription flowing which is in line with the Internet Plus model took shape. The hospital owns the most advanced equipment in the world and promotes extensive cooperation home and abroad. Long-term and friendly exchanges with many well-known institutions such as Johns Hopkins University, Mayo Medical Center, NYU School of Medicine, UCLA and University of Chicago. With Tianjin International Medical Service Center, the hospital is able to provide health care for foreigners in Tianjin. It has won many honorary titles such as "National Best 100 Hospitals", "National Model Hospital for Patients", "National Top Ten Baby-Friendly Hospitals", "National Excellent Institution of the 4th Hospital Cultural Building" etc. 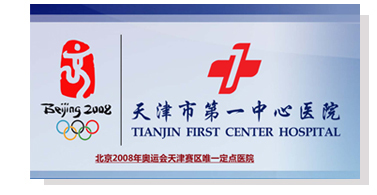 and was defined as the only "Designated Hospital for Olympic Games in Tianjin" in 2008. The new location of the hospital is in Houtai, southwest of Tianjin, with an agreeable environment. The main building covers an area of 380,000 m2. The capacity of 2,000 beds will make the hospital the largest medical center in Tianjin. With great expectations, the health workers of the hospital lay stress on service quality and the trust with life. Focusing on the people, they make progress together and forge ahead with determination. They will embrace a promising future and make more contribution to human health.